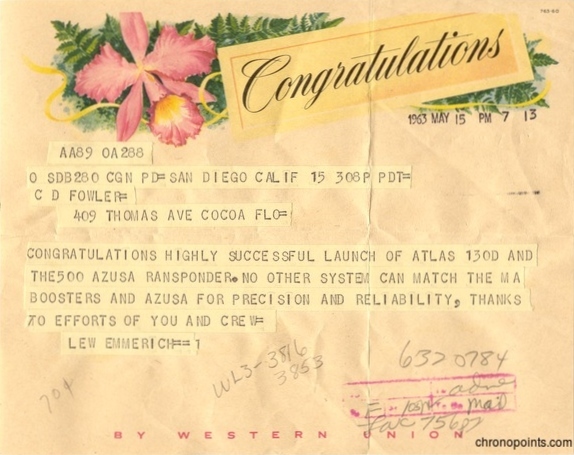 Dr. Cal Fowler (1929-2013) received this congratulatory telegram from Lew Emmerich, a General Dynamics Program Director based out of San Diego, California. Emmerich was involved in America's space program from Project Mercury to Project Apollo, and was described in his obituary as a "Pioneer of America's Space Program." Original telegram from Lew Emmerich to Dr. Calvin "Cal" Fowler, May 15, 1963): Private Collection of Dr. Calvin D. Fowler. 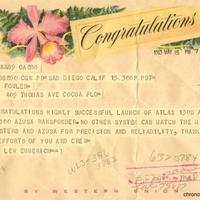 Digital reproduction of original telegram from Lew Emmerich to Dr. Calvin "Cal" Fowler, May 15, 1963). Originally created by Lew Emmerlich and owned by Dr. Calvin D. Fowler. "Lewis Emmerich." The Salt Lake Tribune, February 15, 2004. http://www.legacy.com/obituaries/saltlaketribune/obituary.aspx?n=lewis-emmerich&pid=1931493. Emmerich, Lew. “Telegram from Lew Emmerich to Dr. Cal Fowler (May 15, 1963).” RICHES of Central Florida accessed April 21, 2019, https://richesmi.cah.ucf.edu/omeka/items/show/6409.